Single-component, light-cured adhesive for direct and indirect bonding procedures that features compatibility with all etching techniques: self-etch, selective-enamel-etch and total-etch. Available in the unique VivaPen delivery for fast and convenient direct intra-oral application with minimal waste to optimize cost-effectiveness. • Direct-placed light-curing composite and compomer restorations. • Core build-ups with light-, self- and dual-curing composites. • Adhesive cementation of indirect restorations with light and dual-curing luting composites. • Intraoral repair of fractured composite and compomer restorations. • Desensitization of hypersensitive cervical areas. • Sealing of prepared tooth surfaces before temporary / permanent cementation of indirect restorations. • Efficient delivery – up to 190 single-tooth applications per VivaPen. • Universal application – for all bonding and etching techniques. • Predictable results – high bond strength on dentin and enamel. 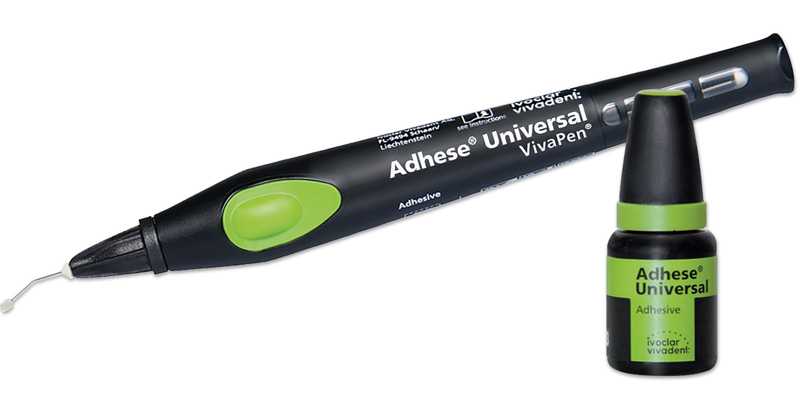 Contains: 1 x 2ml Adhese Universal VivaPen refill, 100 VivaPen snap-on cannulas, 20 VivaPen protective sleeves.